In the previous post, we have proved that if the opposite sides of a quadrilateral are congruent, then they are parallel. In this post, we are going to show that if the opposite angles of a quadrilateral are congruent, then it is a parallelogram. 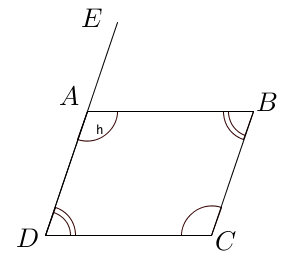 In the figure below, we have quadrilateral ABCD with and . To show that it is a parallelogram, we have to show that and . 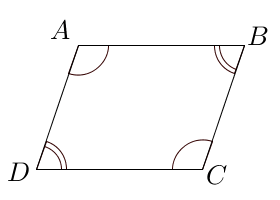 Theorem: If two pairs of opposite angles of a quadrilateral are congruent, then it is a parallelogram. It is given that and . We substitute with and with since these pairs are congruent opposite angles. On the other hand, if we extend DA to form angle DAE as shown, then we form . It can be easily shown using a similar argument, (left as an exercise).